Twinkling fairy lights, warming fires, cosy cafes serving hot chocolate, glogg, lussekatter (saffron-flavoured buns), gingerbread biscuits, local delicacies and smorgasbords; choral performances, Christmas market stalls and the chance of snow… The Swedish capital, Stockholm, has all of the attributes required for your perfect festive break. On arrival at Stockholm Arlanda airport, you will be transferred by private taxi to the Nobis Hotel in the heart of the city. Bordering the Norrmalmstorg square, the property is close to the city's shopping streets, the elegant Ostermalm district, Kungstradgarden and the Strandvagen waterfront parade. In fact, most of the city’s key attractions and sights are within a gentle stroll. Overnight at the Nobis Hotel in Stockholm. Opportunity to intersperse some sightseeing (a 48 hour Stockholm Pass, providing complimentary access to 60+ attractions and free boat and bus tours, is included for you) with visits to one of the many Christmas markets in the city. We would highly recommend the Christmas market at Skansen, Stockholm’s open-air museum (open December). Dating from 1903, the market still has an atmospheric feel of yesteryear and is held amidst the museum’s historical houses and farmsteads. There are craft demonstrations, live music and plenty of stalls selling local food, handicrafts and design pieces. Day at leisure in Stockholm. 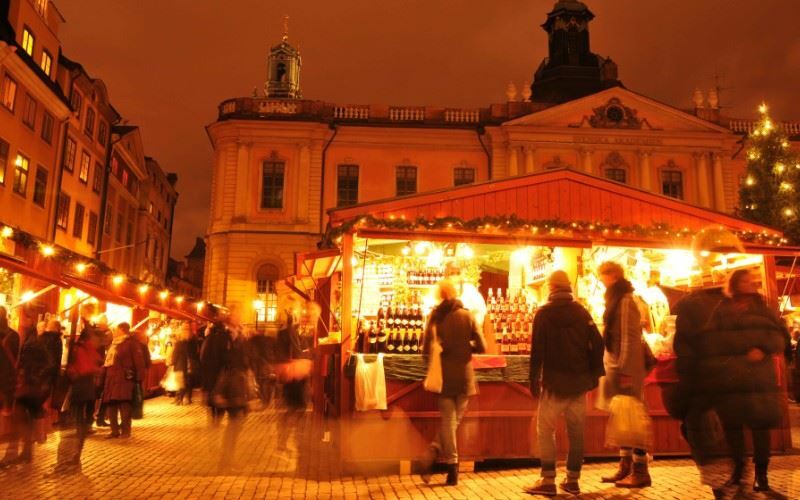 Continue your Christmas shopping at the market in the historic Stortorget Square and in the boutiques of Gamla Stan. Then head to Ostermalm for luxury brands, the iconic department store NK, Nordiska Kompaniet (think Harvey Nichols and Harrods) and for popular Scandinavia clothing - H&M, &Other Stories, Filippa K and V Ave Shoe Repair. For dinner this evening, why not treat yourself to a Christmas smorgasbord at the Skeppsholmen Hotel (pre-bookable by Sunvil) or at the Grand Hotel, City Hall Cellar or Skansen? Nothing says Christmas like a a mouthwatering, festive smorgasbord of herring, cold cuts of meat, hot dishes and cheeses. Transfer by private taxi to Stockholm Arlanda airport for your return flight home.